The Australian Library and Information Association has announced that this year’s National Simultaneous Storytime book is: I Got This Hat, written by Jol and Kate Temple, illustrated by Jon Foye, and published by ABC Books, an imprint of HarperCollins Publishers (2013). You can read my review of both the I Got this Hat book, and the I Got this Hat app here. 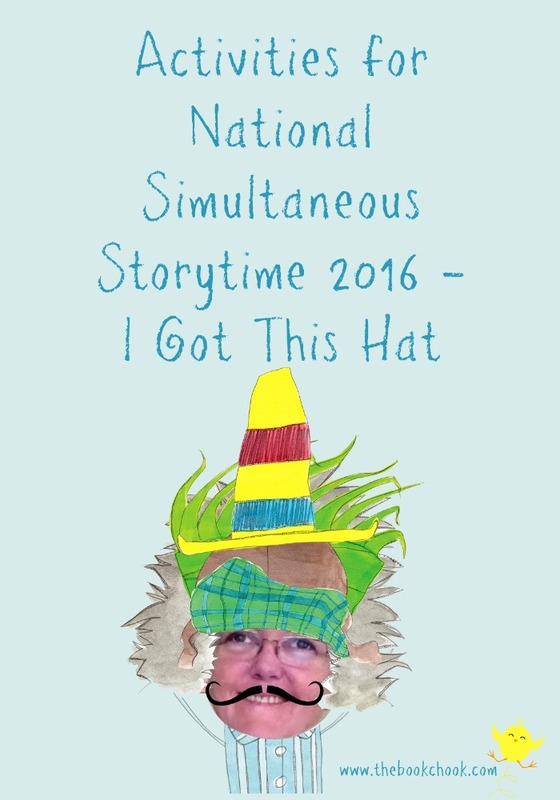 Taking place at 11.00am on 25 May, 2016, what a joyous celebration of books and fun this National Simultaneous Storytime is going to be! Although the text is very simple in the chosen book, I Got This Hat, I love that there is such a range of activities suggested by the theme. More importantly, there are many activities that can be embraced by the whole school, and incorporated into curriculum studies. Yes, this is an excellent educational outcome, but you know what I love? It gives older kids “permission” to immerse themselves in the fun of picture books. Sadly, some people think once you are old enough to read independently, you should quit enjoying picture books. I hesitate to think how they would judge someone of my age who loves them as a form of art, as well as entertainment! ALIA have lots of wonderful activities you can use with kids on their NSS page. Why do people wear hats? Are all hats the same? How are hats the same/different? What sort of hat did a knight/princess/pirate wear? What sort of hat does a cricketer/baseball player/chef wear? What kind of hats keep us shaded? What kind of hats keep our heads warm? Do animals wear hats? What might some of the problems be? Should a hat express an animal’s personality? Can you design a hat you think would suit an animal you know? Do kids know any other books for children that feature hats? Think about similarities and differences between books like I Got this Hat and say, Caps for Sale, I Want My Hat Back or The Kinder Hat. Has anyone heard of The Cat in the Hat or the Mad Hatter? Who is your favourite book or movie character? What sort of hat do you think this character would wear? Draw your character wearing a hat of your design. What better time than to apply De Bono’s Six Thinking Hats with any problems that arise in these activities below! 1. Hats are a wonderful prop to use in improvisation. Kids of any age can do this - wear the hat and let it suggest what they pretend to do and or say. Pairs of kids 7+ could develop a dialogue between two characters suggested by the hats, and go on to develop short scenes with actions, movement and dialogue. Mix it up with older kids by having one character wearing a hat begin a soliloquy, but then another hat-wearing character enters who interacts but may well send the scene in another direction. Continue adding characters. 2. Half the group is the artists; the other half is the statues. Artists put statues into any pose they like, then artists add a hat to their creations. Swap roles. Piggyback on ideas from a Pinterest display of paper plate hat making and Pinterest Hat Crafts. More ideas via Kids Hat Crafts from Munchkins and Mayhem. Paper and card are probably the first materials that come to mind when we think of decorating a hat. The easiest shape for littlies is probably a strip of thin card wound into a circle around a child’s head and then removed and stapled (the card, not the head!) If you have limited time, you might like to use a hat template from First Palette. If you’re not in a tearing(!) hurry, consider other materials like fabric, papier-mâché (e.g. Spring Hats from Buggy and Buddy), feathers, leaves and seeds, printed hands and feet cut out and used to decorate etc. Ideas from Pinterest Paper Hats. Op shops, garage sales and charity stores can be a great source for buying a cheap hat to recycle. Children might like to think of a character or theme to change their hat into. How can they express their own personalities and interests via a hat? They could completely cover a hat with tissue or brown paper and then add to that. Starting from scratch is another option, and can be a great learning activity for kids as they gather “junk” and try to design a hat with it. Limiting older kids to one material like newspaper or brown paper can result in them having to use their ingenuity and imagination, rather than copious amounts of glue and glitter. The Australian Curriculum encourages teachers to link to other learning areas. Consider how I Got this Hat and hat-making generally could draw on Curricula like History, Maths, the Arts etc. Ask children what hats are for. How have they changed over the ages? What design elements need to be considered when designing a hat? What materials, tools and processes could help us design a hat? If possible, have children explore hats in different times and cultures. Encourage kids to think creatively and critically about a hat to design, and to use digital technologies if they have access to them. Relays get kids moving and that’s great. Add variety by using other items as hats - old tracky daks, wigs, a bean bag held on by one hand - anything wearable is fair game. You could also persuade staff members to have a relay race wearing the hats the’ve constructed for the day. Perhaps staff could vie with parents in a "friendly" relay? Other activities could include throwing bean bags or balls into a giant hat, doing the Mexican Hat Dance, rolling balls through a hat with no top, and running around hats as markers. Children may not have time to make a hat in the NSS lesson. Instead, they could make a hat at home and bring it in to display. Hats could be paraded a la Easter Bonnet, or set up on desks or tables for viewing. If possible, set aside some time for brainstorming, discussion and design before children make their hats at home. Sometimes older kids don’t want to “dress up”. Ask them to design and make a hat for a soft toy or model of their choice (something they played with when they were young!) Have a display of these toys wearing the hats the kids have made. Embed literature into this activity by suggesting kids dress a toy as a book character, or design a hat to suit a book or character from that book. Have a different hat display for primary students that encourages word play. Can kids think how to make a hat to represent “hatastrophe”, “hataclysm”, “hatamaran”, “hategorical” or “haterpillar”? What other words have a beginning that could be replaced with “hat”? Make or get some crazy props (spectacles, moustache, fake beard etc) and ask an adult to take children’s photos wearing their hats and props of choice. If children have access to iPads, you can download the I Got this Hat app for free. It encourages kids to put themselves into an image, wearing one or many of several hats. Do set aside 11am on Wednesday 25 May 2016 as adults and kids across Australia read I Got this Hat. Check with your local school or local library for an NSS event. Or gather some friends together and indulge in the fun of hat-making before, on or after the date! Great to know, Chris - TY! I hope you and your students enjoy the day, Mrs B!